The Ascadian Isles are the fertile southern lowland region of Vvardenfell. The region is dotted with agricultural plantations under the jurisdiction of Redoran-controlled Suran, located in the northeast of the area. 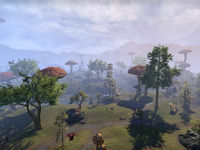 The Tribunal-controlled Vivec City, capital of Vvardenfell and home of Lord Vivec, is situated in the south of the region. This page was last modified on 19 March 2018, at 05:16.